When Haslett had been working at Cochran Boiler Company nearly five years, she saw an advertisement in the journal Engineering that ran "Required: Lady with some experience in engineering works as organizing secretary for a women's engineering society". She answered the advertisement and was duly appointed the first secretary of the Women's Engineering Society, beginning in February 1919. 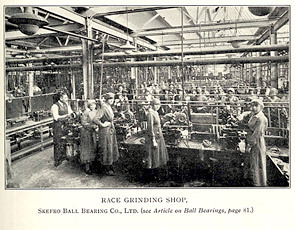 As World War I (1914-18) ended, women needed to ensure that the opportunities to enter traditionally-male professions were not lost and in 1918 the National Council of Women of Great Britain (founded 1895 as the Union of Women Workers) had formed a committee to examine the problems of women taking up engineering as a post-war career. One of the members of this committee, the Hon. Lady Parsons, wife of Sir Charles Parsons (1854-1931), the inventor and manufacturer of the steam turbine, was the prime mover in encouraging the committee to form the Women's Engineering Society (WES), which is still going strong today. The new society was open to women in all branches of professional engineering and allied fields of metallurgy, physics, chemistry and mathematics. 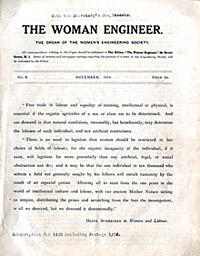 Its aims were "to promote the study and practice of engineering among women and ... To enable technical women to meet and to facilitate the exchange of ideas respecting the interests, training and employment of technical women and the publication and communication of information on such subjects." These aims chimed with Haslett's convictions. She explained much later that she had "always believed in women, and when I was young I thought I had a mission to help to clear up the silly prejudice against them ... In addition I had a great love of engineering. How wonderful it would be ... to weld the two and open up the world of engineering to women!" Haslett saw that the tasks facing the WES were to consolidate the gains made by women during the war, to break down the prejudices of employers towards women in the workplace, and perhaps most important of all to ensure that women gained access to the regulation training courses at universities and engineering institutions that had hitherto been open only to men. The society acted as advisor in planning women's careers, a role in which Haslett inspired two generations of engineers and electrical industry workers. One of her first jobs was to edit the society's journal, The Woman Engineer, the first issue of which appeared in December 1919. Issued quarterly, it would be edited by Haslett until the end of 1932. In 1921, the WES published Facilities for Training Women as Engineers, also edited by Haslett, together with a list of the branches of engineering in which women were already employed. Other publications would follow. The WES had three branches by 1920, each of which ran meetings and visits for local members. Between the two world wars a few women managed to enter most branches of engineering but progress was slow. Eventually, the WES branches died and only the London headquarters remained. However, World War II (1939-45) saw a tremendous influx of women engineers, membership grew and branches were revived in London, Manchester, and South Wales. Two recurring themes engaged much of Haslett's energy once the WES was successfully launched — the difficulties faced by women on the factory floor which had hitherto been a masculine preserve, and in competing with men for engineering managerial posts. Haslett made a study of payment and incentives in industry, giving several lectures covering such subjects as piece-work, bonus schemes, co-partnership, profit-sharing, and rewards for suggested improvements — many of which were radical ideas at the time. 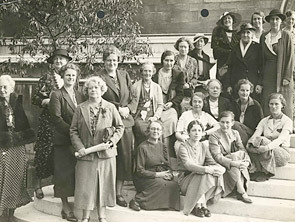 During the 1920s membership and associate membership of many of the engineering institutions were opened to women. Indeed the Institution of Electrical Engineers had admitted its first woman member, Hertha Ayrton, in 1899. In 1922 and again in 1925, Haslett wrote to the Royal Society asking about their views regarding the admission of women to fellowship, pointing out that the engineering institutions had now opened their doors to all. In the event, the Royal Society didn't elect its first women fellows until 1945. In 1925, the WES came to general public notice when it organised a special conference at Wembley, in association with an exhibition of 'Women in Science, Industry and Commerce'. The conference was opened by the then Duchess of York (later Queen Elizabeth the Queen Mother). This event also made Haslett known to a wider public. 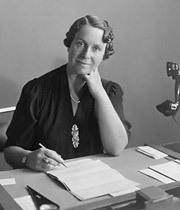 She remained secretary of the WES until 1929, when she became honorary secretary, and she was its president from 1940-41. In 1969, the WES could still write, "The Women's Engineering Society is a group of women with a common interest in a profession which is still generally considered to be a male preserve, and with a desire to help other girls and women who would like to be engaged in engineering". The membership by then included every branch of professional engineering and its allied fields as well as technical and scientific teaching and writing. Today the WES continues the original aims. It promotes the education, training and practice of engineering among women, increases public awareness of the contribution women can make to engineering, provides a forum for the exchange of opinions and experience respecting education, training and employment for women with interests in engineering. Lady Parsons, a member of the National Council of Women committee set up to examine the problems of women taking up engineering careers after WWI. She encouraged the formation of the WES. 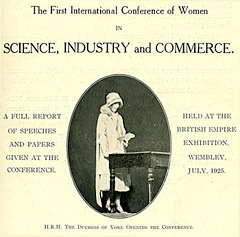 Report of the first International Conference for Women in Science, Technology and Commerce, held at the British Empire Exhibition at Wembley in July 1925. The conference was organised by the WES and opened by the then Duchess of York. Women engineers at a WES conference.